Blog - How dense are you? New research shows that not all dense breasts pose an increased cancer risk. How dense are you? New research shows that not all dense breasts pose an increased cancer risk. Women who are found to have dense breasts on a normal mammogram are sometimes encouraged to undergo further imaging to check for breast cancer, but a new US study shows that more than half of these women are at not at high risk and recommends that other risk factors should be considered before further investigation. Some women have more dense breast tissue than others, for reasons we do not entirely understand. For most women, breast density decreases with age, but in some women there is little change. 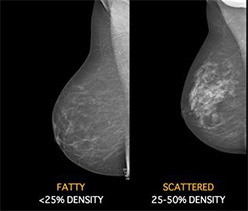 Mammograms of breasts with high density are harder to read and interpret than those of less dense breasts and high mammographic density has been felt to be important for two reasons. Firstly, the bright areas can cover up or “mask “breast cancers, reducing the sensitivity of mammography. Secondly, for women of the same age, those with higher mammographic density have been felt to be at greater risk of a future breast cancer. As a result, 22 US states have introduced laws requiring health providers to notify women whose mammograms show they have “dense breasts”. These women are encouraged to discuss this finding with their doctor and, if necessary, have follow-up ultrasounds or magnetic resonance imaging scans to look for possible breast cancers. A new US study however shows that more than half of these women with dense breast are actually not at high risk and recommends that other risk factors should be considered before further investigation. The study, reported in Annals of Internal Medicine, May, 2015 (1) followed a cohort of 365 426 women aged 40 to 74 in the United States who had 831 455 digital screening mammography examinations from 2002 to 2011. Researchers studied the association between breast density, the five year risk of breast cancer, and the rate of interval cancers, which were defined as invasive cancers detected within 12 months of an apparently normal mammogram. Half of women ages 40 to 74 with dense or heterogeneously dense breasts were at low or average risk for breast cancer, and only about one-quarter of those with dense breasts exhibited high rates of interval breast cancer, according to the large population-based study. Results showed that 51.0% of women with heterogeneously dense breasts and 52.5% of those with extremely dense breasts had only a low to average five year risk of breast cancer, and their rates of interval cancers were also low. Investigators calculated that risk was elevated only for the 24% of women with extremely or heterogeneously dense breasts who also have other risk factors, such as a family history of breast cancer. “Our results suggest that breast density should not be the sole criterion for deciding whether women with dense breasts should be considered for supplemental breast screening,” said the researchers. “Age and breast cancer risk influence screening performance, cancer incidence and tumour stage at diagnosis. These factors should be considered along with breast density to optimise identification of women with high interval cancer rates or high rates of false positive results who may benefit from supplemental screening tests,” they concluded, and the next steps would be to see how women at increased risk for breast cancer might respond to different types of supplemental imaging tests, such as screening ultrasound or MRI.